By leakage of the cooling agent from the main heat radiator, heat exchanger or through the blind plugs of the cylinder jacket it is not necessary to take drastic measures at once and to disassemble the heat radiator or to remove blind plugs and to repair places of leakage. 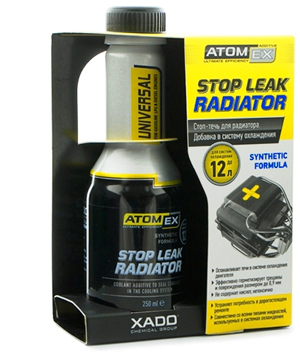 In most cases it is enough to use special agents: STOP LEAK - liquid radiator sealer or Stop Leak Radiator. . 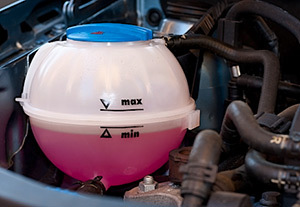 Adding one of these products into the cooling agent and short-term operation of the car allow complete repairing of leaks up to 0.9 mm in diameter during the car operation. In case of expansion tank depressurization, damage of the water pump sealing, gasket ring of the water pump body, cylinder head gasket, the damaged or destroyed parts should be replaced. By leakage of the cooling agent through the unpressurized junction pipes joints or cylinder head gasket it is necessary to tighten (or to replace) ring clamps and to fasten the tension bolts of the cylinder head.